A fascinating exhibit at the Van Gogh Museum that focuses on the parallels between Vincent van Gogh (1853–1890) and Edvard Munch (1863–1944). Despite the fact that both artists have never met, their lives were remarkably similar and both created paintings in the same period that were powerful and intense. During their time in Paris, both lived in the same neighborhood (Montmartre) and also moved in the same artistic circles, discovering Impressionism and Post-Impressionism along the way. Vincent and Edvard also suffered from poor health throughout their lives and each was unhappy in love, surrendering their lives to the creation of their art. On view at the Van Gogh Museum Sept 25–Jan 17. 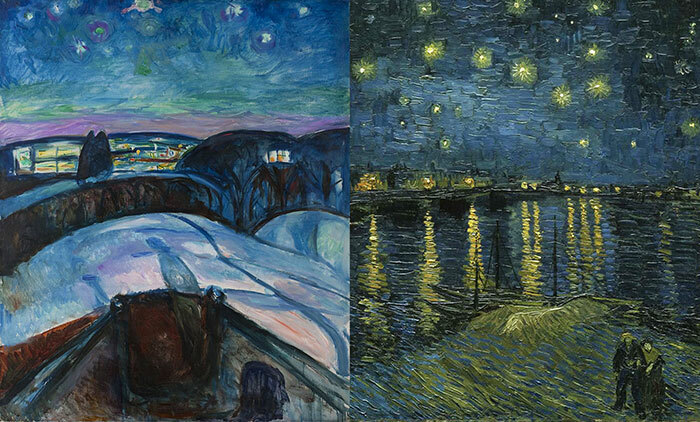 Vincent van Gogh and Edvard Munch led similar lives.